Groups make Crossroads RV Park their weekend home year after year. 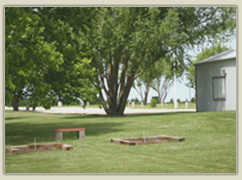 Conveniently located and central to many Eastern Kansas locations, Crossroads RV Park makes an ideal spot for all camping clubs. A large meeting room of 1800 square feet is able to accomodate any size group. Cool Air Conditioning is availiable for those hot Summer afternoons. Wood heat may be used during the cooler months. Call for group rates and availiablity . . .